A Supreme Court of India bench of Justice M.Y. Iqbal and Justice C. Nagappan finally dashed the hopes of five hawkers who lived on Supreme Court Complex for more than four decades by dismissing an appeal filed by one of the tea vendors Sri. Dharam Chand. He was given hawker’s license (Teh Bazari ) by New Delhi Municipal Council, and was recoginsed as a street vendor, but due to the increased threat perception, particularly in the light of Delhi High Court Bomb Blast, all the five were relocated to different places, virtually rendering them jobless. 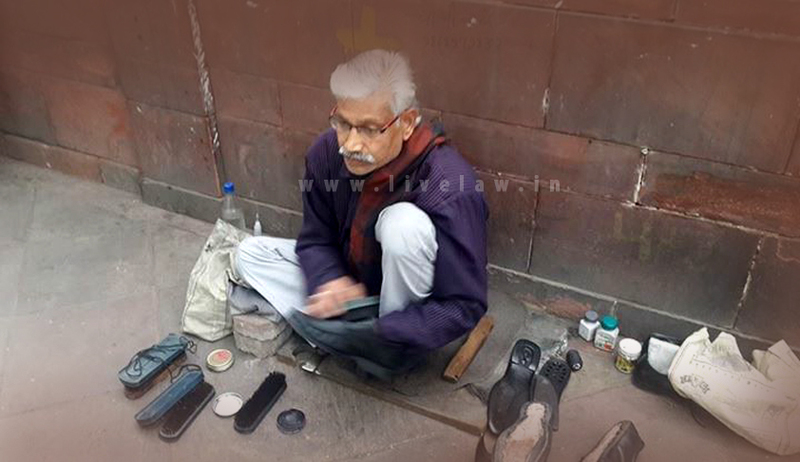 Mr. Dharam Chand was squatting outside the Supreme Court for more than three decades and was selling Pan, Beedi and Cigarettes. He challenged his eviction order unsuccessfully upto High Court, and finally in the Supreme Court. Though the judges have expressed their sympathy, they expressed the helplessness in view of the threat perceptions portrayed before the bench by the security agencies. Mr. Salman Kurshid who appeared for Dharam Chand was supported by Mr. Dushyant Dave, who is currently the President of Supreme Court Bar Association. In fact Mr. Dave had earlier taken up the issue of Mr. Radhey Shyam, a cobbler and one among the five, with the Municipal authorities for a proper rehabilitation of them by allocating a space around the Supreme Court area itself, but the same was refused. LiveLaw spoke to Mr. Radhey Shyam who was repairing the shoes. He started his trade sometime in 1974. He shared his experiences and interactions in a dejected mood. According to him, almost all Senior Lawyers of repute, including Mr. Ram jethmalani and Kabil Sibal had availed his services, during their early days. Many of the lawyers whom he served later became Supreme Court judges . He remembers vividly that in late 70’s he was even called to the chamber of Chief Justice for repairing the carpets, without any security or hindrance. Over a period of time all five of them i.e., Laxmi Narayan Tiwari (Pan vendor), Sukh Lal (Vegetable Vendor), Raju Chatterjee (Snacks vendor), and Mr. Dharam Chand (Appellant ) have became a serious threat to the safety of the institution. No doubt, the Supreme Court of India is one of the most vital installations in the country and is protected by multiple layers of security cover. While acknowledging the importance of security cover and increasing the threat perceptions, the State is equally bound to protect five squatters who spent their entire life span serving many judges, senior lawyers and litigants alike and other stake holders of in the administration of justice.